Importing presets is covered in Chapter 2.12 Using the Supplied FX Presets in the REAPER User Guide. I created these presets because I've seen a lot posts here from people who have no idea where to begin with EQ or mixing. I believe that a mix can be greatly improved by removing unnecessary frequencies from individual tracks. These ReaEQ presets are variants of a British EQ preset I previously made containing high/low cuts, high/low shelves, and two peak filters. Each instrument preset has only the Low Pass & High Pass filters set. All shelves (high @ 12kHz & low @ 80Hz) and peak filters (@ 500Hz & 2kHz) are at unity. The HPF is set below the lowest fundamental note of each instrument and the LPF is set above the highest harmonic frequency or 18kHz, whichever is lower. British (DEFAULT), Vocal-Male, Vocal-Female, Guitar, Bass, Piano, Kick, Toms, Snare, Saxophone, Trombone, Trumpet, Violin, Cello, Banjo, Mandolin. Additionally, a single band-pass preset is included which I find handy for identifying specific frequencies that I'm searching for (better than peak-sweeping). These presets are a starting point and will need to be tailored to each recording and mix. I made these to help people who have no idea where to start with EQ and mixing. Just removing unwanted low & high frequencies from individual tracks can clean up a mix tremendously. The "British" EQ I derived was not any specific gear, but has all bands set at the typical frequency to most small-format mixers for live use. Of course, in ReaEQ they are all adjustable to whatever your heart desires, but the high-shelf & low-shelf are usually fixed frequency and the two peak filters sweep-able. I set the peaks at the typical median frequency. The intention was to only adjust frequency for HPF/LPF, gain for shelves, and gain & frequency for peak filters. I hope someone finds these useful. Cheers! Last edited by insub; 03-15-2018 at 07:36 PM. Windows 7 Pro. Intel i7 3400ghz. 16GB Ram. Focusrite Scarlett 8i6. Reaper 64.
suleiman: "WTF r u ppl on abt ?" But how can I add these to the stock presets? I have put the file in the Reaper directory but they are not seen by Reaper? 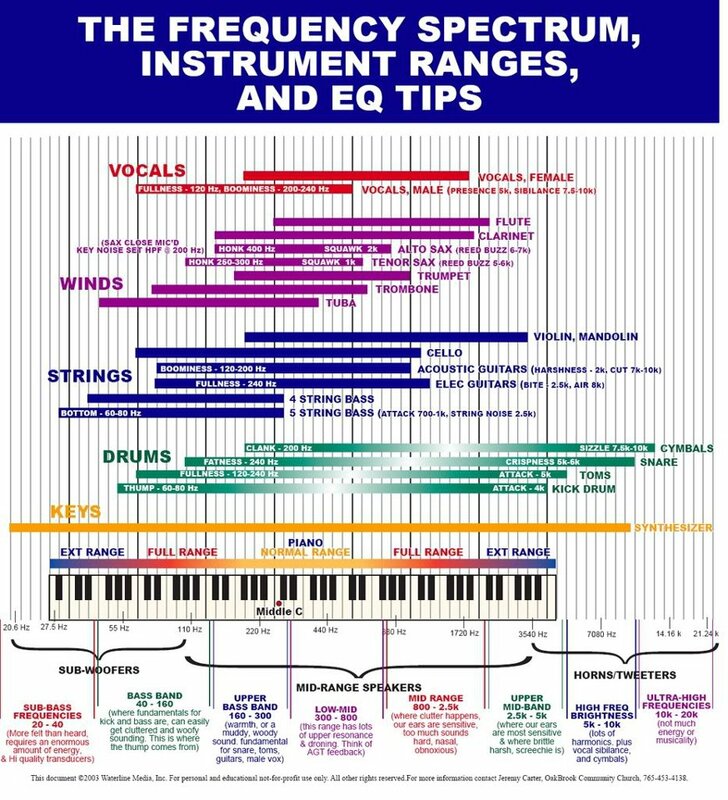 Can I also point out this web page which is an interactive aid to understanding how instruments fit together in the audio spectrum. Really good when you are then making the extra decisions about cut/boost frequency bands in order to get things to sit neatly in a mix. Hope it's useful to some folk. I find it to be one of those little but invaluable aids. @Paul99 Make a note of where you have the file, then open ReaEQ and import them. rpl files go in the Plugins -> FX folder so you can check after importing or just copy there ... I believe. I use a portable Reaper so it is easy to find. You may have to restart Reaper to see them. Hi RobertP, thank you! I always wonder how people know these things because I could not find this in the manual. Thanks, Bob. I meant to add that and a couple other similar links in the OP. I will add them now to the top post. I used this and other Instrument Frequency Charts to determine the HPF/LPF set points. And, to all, You're very Welcome!